Because Barack Hussein Obama II was evidently born and raised in Switzerland, it’s highly likely that his purported education within the United States is a complete fraud. According to FactCheck.org, a Project of the Annenberg Public Policy Center, Obama’s college transcripts and university records have not been released. This is because, in all likelihood, the collegiate transcripts: a) do exist, or b) have been completely fabricated. In an August 20, 2008, report from CNN entitled “Barack Obama Revealed”, CNN anchor Suzanne Malveaux stated that “Barry remained a lackluster student”. Obviously, Obama cannot simultaneously be both a lackluster student and genius. Malveaux’s statement contradicts Obama’s collegiate accolades which boast a Bachelor’s degree from Columbia College at Columbia University, a Jurisprudence Degree from Harvard Law School, as well as the prestigious title of President of the Harvard Law Review. As evidenced herein, there is an overwhelming amount of circumstantial and direct evidence which suggests that there is something very suspicious in respect to Obama’s alleged education (or lack thereof). Despite allegedly spending 19-years as both a student and as a professor at 4 different colleges and universities within the United States, there is virtually no hard evidence whatsoever that a person named “Barry Soetoro” or “Barack Hussein Obama” was the student and professor that he claims to have been. All that exists by way of evidence are the accounts of a few alleged classmates (none of which were ever photographed with Obama), some fabricated enrollments forms, and a collection of random photos, most of which have evidently been photoshopped. 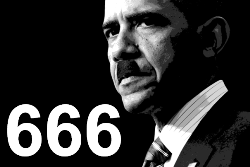 This notion only makes sense when it’s understood that: a) Obama is a Manchurian Candidate under mind control who would be exposed as an intellectual fraud in a collegiate setting, and b) the CIA would never risk the safety of America’s first dictator in the crime-ridden cities of Chicago, Los Angeles and New York. In other words, Obama had to be protected both mentally and physically from the outside world, hence the overwhelming lack of evidence in respect to his alleged time as both a student and professor. During a speech at the Conservative Political Action Conference on February 10, 2011, current U.S. presidential candidate Donald J. Trump stated, “[Obama] came out of nowhere. Came out of nowhere…In fact, I’ll go a step further: the people that went to school with [Obama], they never saw him, they don’t know who he is. It’s crazy”. Considering that the comments came from the mouth of Trump, they have subsequently been dismissed as partisan despite the fact that they are actually true. Because Barack Hussein Obama II was evidently born and raised in Switzerland, it’s highly likely that he never attended Occidental College in Los Angeles, California from 1979 to 1981 as alleged. This notion is corroborated by a wealth of circumstantial and direct evidence (or lack thereof) which suggests that Obama’s time at Occidental College has been completely fabricated. Although Obama may have been secretly enrolled at the college, evidence suggests that he never attended a single class with other students. The notion that Obama never attended Occidental College was foreshadowed by a Wall Street Journal report from October 9, 2009, in which Occidental President Jonathan Veitch stated, “Literally, you could come to Occidental and not know the president was ever here”. This is because, in all likelihood, Obama never attended Occidental College. Lastly, in the event that Obama lived in Los Angeles for 2-years while attending Occidental College, it would stand to reason that there would be at least one photograph of Obama with a classmate, friend, girlfriend or professor, but there is not. Aside from a few photos of Obama allegedly attending a rally in Pasadena, there are no photos of Obama at a touristy location in Southern California such as the beach or Disneyland. In short, there is no hard evidence which confirms that Obama lived in California or attended Occidental College. In order to help sell the notion that Obama attended Occidental College in Los Angeles, California, Obama graced the cover of “Occidental” magazine in Fall of 2004. 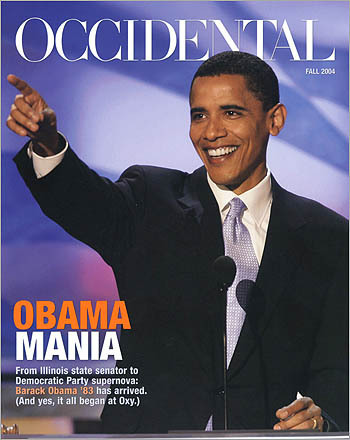 Interestingly the caption on the magazine cover states “OBAMA MANIA…From Illinois state senator to Democratic Party supernova: Barack Obama 83’ has arrived. (And yes, it all began at Oxy.)”. If Obama had attended Occidental College as alleged, there would be no need to highlight his graduation year or the fact that he actually attended the school for the students and staff would surely have remembered the politically active African-American student who was likely taller than most everyone on campus. Nonetheless, roughly 3-years later on January 29, 2007, the Los Angeles Times published a report entitled “Occidental Recalls ‘Barry’ Obama” which stated that Obama has “fond memories” of the school. Unfortunately, aside from two alleged classmates, no else remembers Obama attending the school. Interestingly, the printed version of the Los Angeles Times report used a photograph from Obama’s alleged high school in Hawaii. Evidently, no official photo of Obama was taken for a student identification card when he allegedly attended the school. Roughly 2-year later, a made-for-TV documentary entitled “Barack Obama’s Occidental College Days” (2008) was aired and subsequently released on DVD. The film was reportedly made for the television show entitled “California’s Gold” (1994-2012) in which host Huell Howser visited the campus of Occidental College in Eagle Rock to retrace the two years Barack Obama allegedly spent there as an undergraduate student from 1979 to 1981. The film reportedly contains a conversation with Obama’s first political science professor, a visit with two of his alleged college friends, and a look inside his alleged dorm room. It is imperative to note that Obama was never photographed with any of his alleged friends or professors while at Occidental College. The film also reveals the alleged location where Obama made his first political speech of which there are naturally no photos or videos of. Needless to say, the film is highly suspect for it suggests that CIA was anticipating questions about Obama’s alleged time at Occidental College, hence the propaganda film which was designed to provide first-hand witness accounts of Obama’s time at the school. Later that year on December 17, 2008, TIME magazine published a report entitled “Obama: The College Years” which contained a collection of photographs of Obama which were allegedly taken while Obama attended Occidental College. Interestingly, the photographs were taken by noted psychologist Dr. Lisa E. Jack, Obama’s apparent handler (see below). Consequently, the alleged location of the photoshoot is highly questionable. Roughly 4-years later on October 3, 2012, the New Yorker published a report entitled “Obama at Occidental” which begins by stating that “On February 18, 1981, a student at Occidental College, Barack Obama, delivered his first public speech”. Again, if Obama had actually given the dramatic speech as alleged, there would be no need to emphatically date it and emphatically state it at the beginning of the article. Interestingly, the reports states that sophomore Tom Grauman took “thousands of photos for the Office of Communications”, including dozens of the rally where Obama allegedly gave his first political speech. Predictably however, Grauman did not take one photo of Obama actually giving his speech. This is because, in all likelihood, Obama never gave the speech in question or attended Occidental College in any capacity. Lastly, Occidental College’s website has a special page entitled “Obama at Oxy” (see above photo) which features the slogan “Sometimes where you start out is more important than where you end up”. The statement appears to be yet another desperate attempt to sell the notion that Obama began his college career at Occidental College. Like the aforementioned film, the webpage was evidently created at the behest of the CIA to deflect serious questions about Obama by former students and staff who don’t remember his time at the school. Similar to the aforementioned report from the Los Angeles Times, the webpage of Occidental College uses a photograph of Obama’s from his alleged high school days in Hawaii. If Obama had in fact been a student at Occidental College as alleged, he would have been issued a student identification card with a photo like the rest of the students. Because Barack Hussein Obama II was evidently born and raised in Switzerland, most of his photos during his alleged time at Occidental College in Los Angeles, California were evidently photoshopped and/or staged as part of a photoshoot. Consequently, in order to sell the notion that Obama attended Occidental College, a number of photos have been released of Obama on campus in Los Angeles. Mysteriously, not one of these photos contains a classmate, teacher or family member. Also, the person or persons responsible for taking the photos of Obama have never been publically identified, nor were they photographed in return by Obama which is generally standard practice for college students. Although there are other photos of Obama while he allegedly attended Occidental College, the following four photos in particular are quite telling. PHOTO 1: In the top left photo, which was allegedly taken in 1980, Obama is pictured by the fountain on the campus of Occidental College. A second look at the photo would suggest that it is in fact photoshopped. As evidenced, the Sun is clearly shining from the left as demonstrated by the fact that it is reflecting off of the left side of the metal disc behind Obama. However, the Sun is also casting a shadow of Obama’s body onto the disc to his left, resulting in a silhouette or shadow of his body. Needless to say, the Sun cannot be in two different positions at the same time. 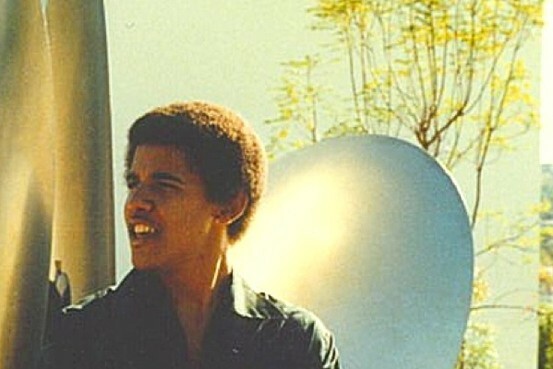 Also, where the back of Obama’s afro borders the Sun’s reflection off the disc behind him, the photo is fuzzy which suggests that Obama’s likeness was photoshopped into the photo at a later date. PHOTO 2: In the top right photo, which was allegedly taken in an Occidental College classroom sometime between 1979 and 1980, Obama is drinking what appears to be a beer or a can of soda. Again, a second look at the photo would suggest that it is in fact photoshopped. Aside from the fact that the shadow to the left of Obama’s arm and hand does not jive lighting in the rest of the photo, Obama’s afro is clearly bleeding into the white background on either side of his head, a clear indication that the image has been photoshopped. Also, the photo contains a blackboard with the words “Eagle Rock”, the neighborhood where Occidental College is located within Los Angeles. The reference to Eagle Rock was designed to sell the notion that Obama actually attended Occidental College. Like most of Obama’s college photos, the photo in question contains no 3D qualities. In other words, Obama is not behind an object or person, nor is he interacting with anything or anyone in the photo. Consequently, Obama’s image could have easily been superimposed upon the photograph without ruining the natural chemistry of it. PHOTO 3: In the bottom left photo, which was allegedly taken near the campus of Occidental College in 1980, Obama is posing for a photoshoot which would be released publically on December 17, 2008, in a TIME magazine report entitled “Obama: The College Years”. Interestingly, the photographs were taken by noted psychologist, Dr. Lisa E. Jack, Obama apparent handler. Consequently, the alleged location of the photoshoot near Occidental College is highly questionable. Nevertheless, the photographs are the most authentic of all photographs purporting to be Obama during his alleged time at Occidental College. PHOTO 4: Lastly, in the bottom right photo, which was allegedly taken at a Pasadena rally sometime between 1979 and 1980, Obama is seen standing with two other males. Again, a second look at the photo would suggest that it is in fact photoshopped. Like most of Obama’s college photos, the photo in question contains no 3D qualities. In other words, Obama is not behind an object or person, nor is he interacting with anything or anyone in the photo. Consequently, Obama’s image could have easily been superimposed upon the photograph without ruining the natural chemistry of it. 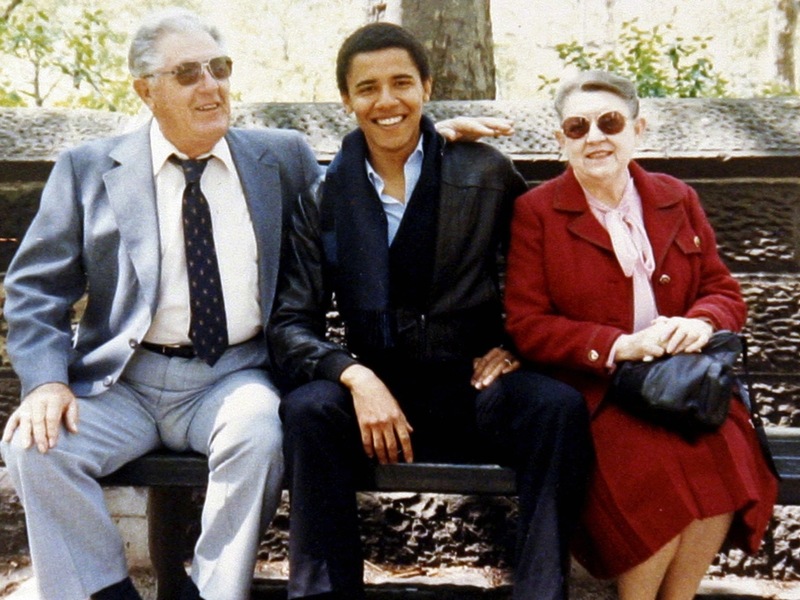 Because Barack Hussein Obama II was evidently born and raised in Switzerland, it’s highly likely that he never attended Columbia College at Columbia University in New York City from 1981 to 1983 as alleged. This notion is corroborated by a wealth of circumstantial an direct evidence (or lack thereof) which suggests that Obama’s time at Columbia College has been completely fabricated. Although Obama may have been secretly enrolled at the college, it appears that he never attended a single class with other students. This notion is corroborated by a New York Times report from October 30, 2007, entitled “Obama’s Account of New York Years Often Differs From What Others Say” which revealed that “Barack Obama does not say much about his years in New York City”. In respect to his book “Dreams from My Father” (1995), which is more than 450 pages long, the report states that Obama “casts himself as a solitary wanderer in the metropolis”. Translation: Obama was a loner in New York City, hence the lack of friends and photos from his time there. The report also states that Obama has “declined repeated requests to talk about his New York years, release his Columbia transcript or identify even a single fellow student, co-worker, roommate or friend from those years”. According to Obama’s former campaign spokesman, Ben LaBolt, “He doesn’t remember the names of a lot of people in his life”. The only human interactions Obama allegedly had while living in New York City for two years were bathing in a fire hydrant alongside a homeless man, living with a Pakistani whom he called Sadik, and chatting with his Puerto Rican neighbors about the New York Knicks. Unlike most undergraduate students, Obama referred to his college days in New York City as “an intense period of study…I spent a lot of time in the library. I didn’t socialize that much. I was like a monk”. In order to sell the notion that Obama actually attended Columbia College, the 1982-1983 student directory of Columbia College claims that Obama lived at 142 West 109th Street (see photo above), while the New York Times stated that Obama lived in Apartment 6A on 339 East 94th Street. In order to corroborate the notion that Obama actually lived at this particular address in Manhattan, the CIA released a phone book listing from 1982 which included Obama’s alleged address on 94th street as well as his alleged phone number, 410-2857 (see above photo). Columbia also released the graduation program from 1983 (see above photo) which predictably contains the name “Barack Hussein Obama”. The fact that these documents were released to the public shows the sheer desperation of the CIA who is frantically trying to maintain the narrative that Obama actually attended and graduated from Columbia College. Whether the aforementioned documents were forged is not known, but it’s highly likely as no one at Columbia College actually remembers Obama, and there is not one single photo or video of Obama actually graduating from the school. In response to the question: “Is it true that nobody remembers Obama attending Columbia University?”, FactCheck.org answered: “At least one of his classmates remembers him well, and the university proudly claims Obama”. In a September 11, 2008, Wall Street Journal report entitled “Obama’s Lost Years”, it was revealed that “Fox News contacted some 400 of his classmates and found no one who remembered him”. Libertarian Wayne Allen Root (who attended Columbia at the same time as Obama) told Reason magazine that, “I think the most dangerous thing you should know about Barack Obama is that I don’t know a single person at Columbia that knows him, and they all know me. I don’t have a classmate who ever knew Barack Obama at Columbia. Ever!”. In response to the incessant claims that “not one person has ever come forward” from his years at Columbia College, the New York Times was forced to publish a propaganda report on January 20, 2009, entitled “Recollections of Obama’s Ex-Roommate” which stated that Phil Boerner was a roommate of Obama’s while attending Columbia College in New York City. Despite living together for over 2-years, Obama and Boerner have no mutual friends and were never photographed together, despite their incessant partying and the invention of the camera centuries prior. Nevertheless, the report states that “Mr. Boerner recalls. Museums. Jogging in the park. Breakfasts at Tom’s on Broadway, not yet the celebrated hangout of Jerry Seinfeld and George Costanza”. Mr. Boerner also recounted his alleged experience with Obama in the January-February issue of “Columbia College Today” entitled “Barack Obama ’83, My Columbia College Roommate”. Interestingly, the article revealed that Boerner met Obama in Los Angeles while attending Occidental College, providing a well-needed alibi for Obama’s alleged enrollment at both schools—a two for one if you will. Because Boerner’s op-ed was fabricated at the behest of the CIA, it begins with the phrase “I was Barack Obama ’83’s roommate at Columbia College in fall 1981. I met him in 1979, when we were freshmen at Occidental College (Oxy) in Los Angeles”, and ends with the phrase “Based on my six years of knowing him in college and the years immediately after”. Needless to say, Bowener’s literary account was designed to publicly date and his relationship with Obama in order to quell the rumors that Obama never attended Columbia College. Lastly, in order to sell the notion that Obama attended Columbia College as a “foreign student” under the name “Barry Soetoro”, a clearly photoshopped student identification card (see above photo) from Columbia College with Obama’s photo was disseminated globally by the CIA. Although Obama’s original name was in-fact “Barry Soetoro”, he never attended Columbia College and therefore it can be deduced that the card is fraudulent in nature. In order to sell the notion that Barack Hussein Obama II actually attended Columbia College, Obama claims to have written a March 10, 1983 essay about two antiwar groups on campus entitled “Breaking the War Mentality” which was allegedly published in Columbia College’s now-defunct student periodical entitled the “Sundial”. Since the magazine no longer exists and no hard copies of the essay have ever been produced, it can be deduced that Obama’s essay is likely fraudulent in nature. In a New York Times report from October 30, 2007, entitled “Obama’s Account of New York Years often Differs from what Others Say”, it was revealed that Obama was “writing his thesis on Soviet nuclear disarmament” while at Columbia College. However, Obama has officially stated that he doesn’t have and therefore can’t release any copies of the thesis-length paper that he allegedly wrote during his senior year. This is because, in all likelihood, the thesis paper does not exist. Obama spokesman, Ben LaBolt, reportedly told NBC News that “We do not have a copy of the course paper you requested and neither does Columbia University”. According to FactCheck.org, a Project of the Annenberg Public Policy Center, “Obama did write a paper on nuclear disarmament for an honors course in American foreign policy during his senior year, but it wasn’t the sort of “thesis” that some colleges require for graduation and keep on file in their libraries, like those that Hillary Clinton and Michelle Obama released”. In other words, Obama wrote a thesis but there is no paper or public record that it even exists. Similar to how Obama was featured on the cover of “Occidental” magazine in 2004, Obama was also featured on the cover of the January 2005 issue of “Columbia College Today”. In an interview with the alumni magazine, Obama claims that although he kept a low profile at while at Columbia College, he was involved with the Black Students Organization and participated in anti-apartheid activities and protests. If Obama was indeed politically active on campus as alleged, scores of students and staff would have surely remembered him, and there would be countless photos of him with other activists at meetings and protests. Mysteriously, however, there is not one single photo or video Obama being giving a speech or being politically active on campus. Obama claims that “…my years at Columbia were an intense period of study…When I transferred, I decided to buckle down and get serious. I spent a lot of time in the library. I didn’t socialize that much. I was like a monk”. In other words, Obama’s excuse for not knowing a single soul at Columbia College is because he was a good student who studied hard. It’s as if Obama wants us to believe that the campus, classroom and library were somehow devoid of people. 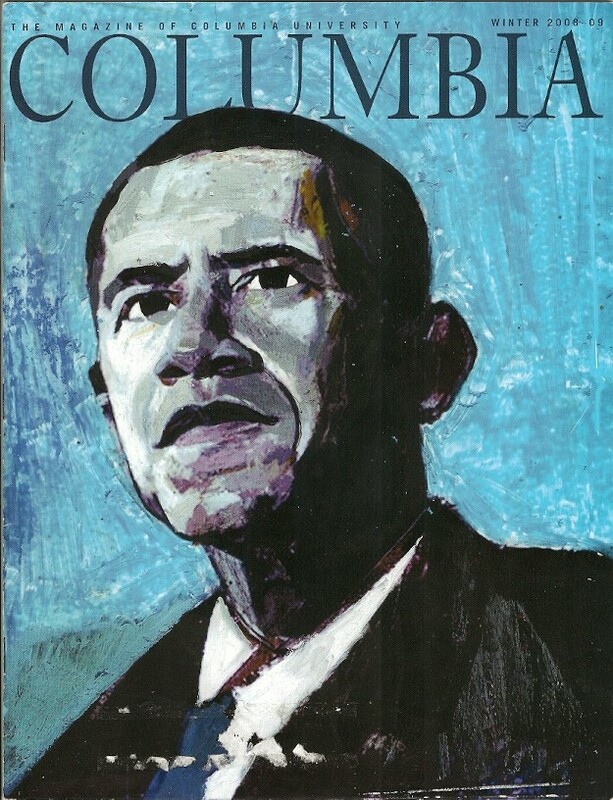 Nevertheless, Obama was also pictured on the cover of the Winter 2008-2009 cover of “Columbia” magazine, further selling the fraudulent notion that Obama actually attended Columbia College. In what appears to be a publicity stunt designed to further sell the notion that Obama attended the school, his legal wife Michelle Obama posted a photo of Obama on social media wearing a Columbia College shirt as depicted in the May 1, 2015, Columbia Spectator report entitled “Obama Exhibits School Spirit with Columbia T-Shirt”. Shortly thereafter on August 31, 2015, the Columbia Spectator published a report entitled “Bollinger Causes Stir with Comments about Obama Returning to Campus in 2017” which implying that: a) Obama graduated from Colombia College, and b) that Obama has the degrees and mental fortitude to teach at a collegiate level. Needless to say, both are doubtful. Because Barack Hussein Obama II was evidently born and raised in Switzerland, most of the photos of him during his alleged enrollment at Columbia College in New York City have evidently been photoshopped or staged as part of an elaborate photoshoot. Even more telling than all the photos is the fact that there is not one single photo or video of Obama graduating from Columbia College in 1983. Since virtually all college graduations are photographed in excess, the lack of photographic and videographic evidence from such an historic milestone in Obama’s life speaks for itself. Nevertheless, in order to sell the notion that Obama attended Columbia College, a number of photos have been produced of Obama on location at Columbia campus in New York City. Mysteriously, none of these photos contain any classmates, friends or professors. Also, the person or persons responsible for taking the photos of Obama have never been publically identified, nor were they photographed in return by Obama which is generally standard practice for college students. Consequently, it appears that the following photos were staged as part of a photoshoot or photoshopped at the behest of the CIA in order to help sell the notion that Obama actually attended Columbia College. While there are indeed other photos of Obama from his alleged time at Columbia College, the following four photos are the most telling: PHOTO 1: In the top left photo, Obama is pictured with a Pakistani man named Sohale Siddiqi (Sadik) who is colloquially referred to as Obama’s “roommate” in New York City. A second look at the photo suggests that Obama’s head was photoshopped onto the body of another man as evidenced by the fact that the black turtleneck sweater does tightly fit Obama’s neck as expected. Also, the line between Obama’s neck and the aforementioned sweater is anything but natural looking. PHOTO 2: In the bottom left photo, Obama is pictured in front of a body of water in Central Park which is located in New York City. By all accounts, the photo of Obama appears real but may have been photoshopped onto the background of Central Park. Like most of Obama’s college photos, the photo in question contains no 3D qualities. In other words, Obama is not behind an object or person, nor is he interacting with anything or anyone in the photo. Consequently, Obama’s image could have easily been superimposed upon the photograph without ruining the natural chemistry of it. Due to the fact that Obama is wearing the same clothes as the photo with his alleged grandparents which is clearly photoshopped, it can be deduced that the photo of Obama in Central Park was likely also photoshopped. PHOTO 3: In the middle photo, Obama is pictured in New York City’s Central Park with his alleged grandparents, Stanley and Madelyn Dunham. Considering that the left arm of Obama’s alleged grandfather is in an impossible position due to the fact that his shoulders are square, it can be deduced that the photo was photoshopped. In other words, from the position Obama’s grandfather is sitting, it would be impossible for him to hold his hand in that particular position. Also, where Obama’s body meets the blue suit of his grandfather and the red suit of his grandmother, the borders are unnaturally fuzzy. This suggests that a person was removed from the photo and replaced with Obama’s likeness. PHOTO 4: In the far right photo, Obama is pictured leaving his alleged apartment in New York City. 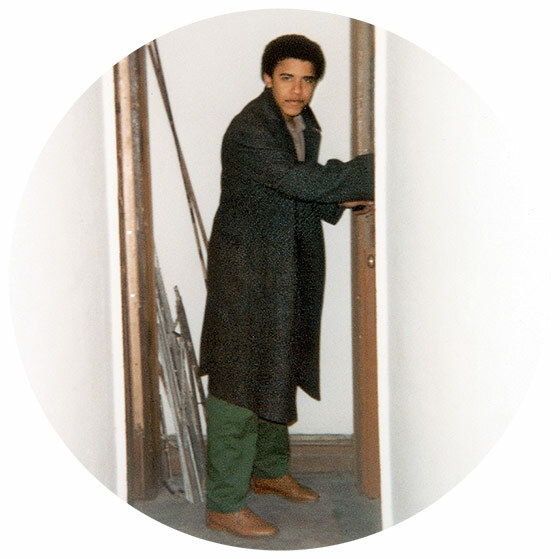 Considering that the body frame and loose clothing of the person pictured does not match that of Obama in any form or fashion, it’s highly likely that the photo was fabricated in order to sell the notion that Obama lived in a rundown apartment in New York City. Because Barack Hussein Obama II was evidently born and raised in Switzerland, it’s highly likely that he never attended Harvard Law School in Cambridge, Massachusetts from 1988 to 1991 as alleged. This notion is corroborated by a wealth of circumstantial and direct evidence (or lack thereof) which suggests that Obama’s time at Harvard Law School has been completely fabricated. Although Obama may have been secretly enrolled at Harvard, it appears that he never attended a single class with other students. That being said, Obama may have been under the tutelage of various professors at Harvard but was clearly never a full-time student, never lived on campus, and never completed the arduous tasks required in order to receive the coveted Juris Doctor degree from Harvard. In short, Obama’s alleged enrollment at Harvard along with his title of President of the Harvard Law Review appear to be colossal hoaxes which were perpetrated by CIA operatives at Harvard who conspired to sell the notion that: a) Obama was an intellectual of the highest capacity, b) Obama graduated from one of the most elite schools in America (i.e., Harvard), and c) Obama was elected to the most prestigious legal position within academia (i.e., the President of the Harvard Law Review). Consequently, in order to create the narrative that Obama was an actual student at Harvard, a number of articles were published under his name and with his likeness during his alleged time at the school. For example, the Daily Herald published a report on May 3, 1990, entitled “Harvard Student Tackles Racism at its Core” which highlighted Obama’s alleged activism on campus next to a photo of then student Obama. 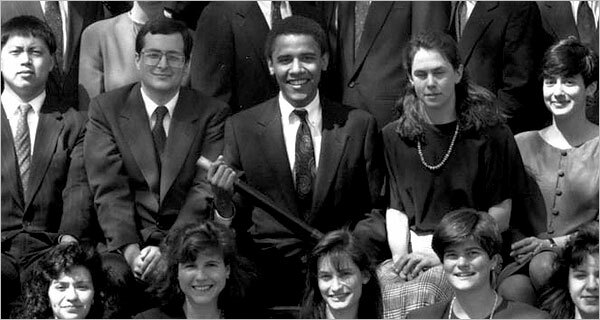 A few months later in the July/August 1990 issue of the Chicago Reporter, Obama allegedly published a report entitled “Top Student: What Kind of Minorities Do Firms Want” which curiously featured a photo of himself. Although the aforementioned reports may have in fact been published, their veracity cannot be substantiated until original hard copies are obtained. In order to further sell the notion that Obama graduated from Harvard, Obama attended the Second Celebration of the Black Alumni Weekend at Harvard where he gave the keynote address at the Harvard Law School Association Award Luncheon on September 17, 2005. Just prior to the 2008 U.S. Presidential election, “Harvard Law Today” published an online report entitled “Obama First Made History at HLS” which provided the names of 7 witnesses who personally vouched for Obama’s time at Harvard (i.e., Professor Kenneth Mack, Professor Laurence Tribe, Professor Martha Minow, Artur Davis, Bradford Berenson, Cassandra Butts, and Michael Froman). Despite their alleged friendship with Obama, none of the aforementioned students or professors were ever photographed with Obama during his three years at Harvard. Also, none of the students or professors were kind enough to take a photo of Obama when allegedly graduated with honors in 1991 as the first African-American President of the Harvard Law Review. In order to further sell the notion that Obama attended Harvard, PBS published a report on May 22, 2012, entitled “Obama Made A Strong First Impression At Harvard” which featured the aforementioned Harvard Professor, Laurence Tribe, who once again vouched for Obama’s time on campus. Considering Tribe still serves as a mentor and informal adviser to Obama, it’s highly likely that he is one of the Harvard professors on the CIA’s payroll and therefore his account of Obama was likely fabricated. Nevertheless, Tribe has produced his daily calendar from March 31, 1989, which allegedly contains and entry which states, “11 AM: Barack Obama (1L)” (see above photo), proof that he in fact had an appointment with the first-year law student Obama. Tribe stated in respect to the calendar that “…it has a phone number, which I guess is his dorm room…and there’s an exclamation point next to it“. Needless to say, people do not keep old calendars for years let alone decades, nor do professors detail a student’s full name, dorm room, academic level and phone number on their daily calendar prior to ever meeting them in person. Consequently, it appears Tribe’s detailed calendar and his alleged meeting with Obama were completely fabricated in order to sell the notion that Obama attended Harvard Law School. In order to provide well-needed political cover for Obama’s alleged time at Harvard, Republican presidential candidate and Harvard alum Mitt Romney stated during the 2012 U.S. Presidential Election that Obama spent “too much time at Harvard, perhaps”. The tem “perhaps” is correct for it appears that Obama never spent any quality time in Cambridge minus a few CIA-ordered photoshoots (see below). Lastly, in what appears to be a CIA-spawned publicity stunt designed to help sell the notion that he actually attended Harvard, Obama visited Harvard Square on March 5, 2014. Interestingly, the Harvard report detailing Obama’s visit to Cambridge used a photo of Obama’s high school graduation in Hawaii above the words “Welcome Back!”. Similar to Columbia College, there are no photos of Obama’s alleged graduation from Harvard in 1991. This anomaly is even more shocking considering that Obama was first African-American President of the Harvard Law Review to graduate from Harvard. Despite this historic event in Obama’s life and in the history of Harvard, no classmates, family members, friends, girlfriends, journalists or professors were curiously able to document Obama’s momentous graduation. 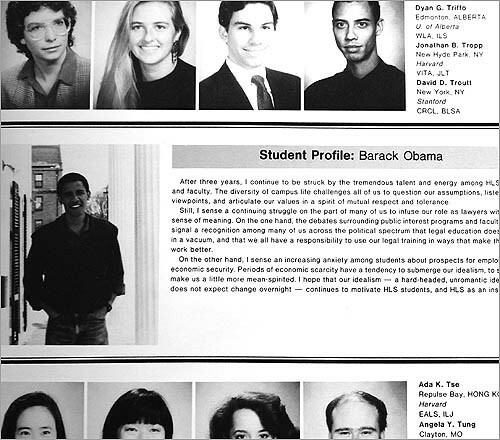 Unlike Occidental College and Columbia College, Obama is evidently depicted in the yearbook of Harvard Law School and the Harvard Law Review for the year of 1991. That being said, Obama likeness is still missing from the aforementioned yearbooks for the years of 1988 through 1990, a definite red flag to say the least. Consequently, until original hard copies of the Harvard and Harvard Law Review yearbooks from 1991 are obtained, their veracity cannot be substantiated. On page 100 of the Harvard yearbook from 1991, there is a standard photo of Obama who is pictured along with 3 fellow students (see above photo). However, unlike his colleagues, Obama is curiously not wearing a tie. The Harvard yearbook also contains an excerpt entitled “Student Profile: Barack Obama” which begins with the words “After three years…”, another time stamp designed to date Obama’s alleged time at Harvard in a public forum. In other words, if Obama had attended Harvard as alleged, there would be no reason to publically document it for all the world to see. Obama is also evidently depicted in the Harvard Law Review yearbook from 1991 as detailed in the Breitbart News report from May 17, 2012, entitled “The Vetting – Exclusive – Obama’s Literary Agent in 1991 Booklet: ‘Born in Kenya and raised in Indonesia and Hawaii’”. Contrary to other Harvard-based reports which state that Obama was born in Hawaii, Obama’s bio in the Harvard Law Review yearbook contains the words “born in Kenya” beneath his photo. Again, until an original hard copy of Harvard Law Review yearbook from 1991 is obtained, the veracity of the bio cannot be substantiated. That being said, the very fact that bio was published in the first place further confirms that there is a CIA-spawned conspiracy to sell the notion that Obama was born in Africa, not Switzerland. Because Barack Hussein Obama II was evidently born and raised in Switzerland, it’s highly likely that he never attended Harvard Law School and was therefore never elected President of the Harvard Law Review on February 5, 1990, as alleged. It is imperative to note that Obama’s alleged election as the first African-America President of the Harvard Law Review was designed to set the precedent for Obama’s election as the first African-American President of the United States. After all, if Obama was good enough for Harvard (arguably the most prestigious university in the United States), he was definitely good enough for the White House. In other words, Harvard was an integral part of Obama’s political pedigree and public persona which was used to sell Obama to the American people. In a February 6, 1990, report from The Harvard Crimson entitled “Obama Named New Law Review President”, it was revealed that Obama’s position as President of the Harvard Law Review put him “in charge of a staff of 80 which edits and publishes articles by legal authorities eight times per year”. Aside from being a highly stressful and taxing position, Obama’s presidency would have put him in direct contact with roughly 100 people on a day-to-day basis, very few if any have vouched for his time on campus. In a video entitled “Obama in 1990 On His Election to Harvard Law Review” (one of only two videos from Obama’s alleged three years at Harvard), Obama speaks of his historic election as the first African-American President of the Harvard Law Review. Aside from the fact that Obama’s voice is far too deep for his age and likeness, his words do not match the movement of his lips. There is also no indication that the video was shot in Cambridge aside from the words “Cambridge, MA – February 1990” which appear at the bottom of the screen. These words are yet another premeditated time stamp designed to sell the notion that the video is authentic in nature. If Obama really served as President of the Harvard Law Review as alleged, he would have surely been photographed and/or videotaped giving a speech during one the clubs many social functions, but he was not. Consequently, it appears that Obama’s tenure as President of the Harvard Law Review was held in name only. That is to say that his alleged presidency was a media creation (see below) which would mean that the legal position sat dormant for the time while Obama allegedly held the position. This notion is corroborated by the fact that there are only two photos which even suggest that Obama served as President of the Harvard Law Review. Firstly, there is a photo of Obama holding a Harvard Law Review book in his hand (see above photo) which was obviously staged as part of a photoshoot to sell the notion that: a) Obama attended Harvard, and b) Obama was elected President of the Harvard Law Review. Secondly, there is a photo of Obama holding a baton-like object (see above photo) which was designed to sell the notion that Obama was in fact President of the Harvard Law Review. However, a second look at the photo suggests that its photoshopped as evidenced by the fact that Obama body does not match the 3D depth of the persons on his right, and Obama’s legs are clearly missing from the photo. Because Barack Hussein Obama II was evidently born and raised in Switzerland, it’s highly likely that he never attended Harvard Law School and therefore was never elected President of the Harvard Law Review on February 5, 1990, as alleged. As previously mentioned, it appears that Obama’s position as President of the Harvard Law Review was in essence a media creation which likely rendered the prestigious legal position dormant for the year which Obama allegedly held the position. Ironically, this scenario is reflected in the White House today where by Obama is a Manchurian Candidate under state-of-the-art mind control while the CIA ultimately pulls the strings. Nevertheless, in order to sell the notion that Obama was elected as President of the Harvard Law Review as alleged, at least three articles were published which in essence serve as a public time stamp that Obama was in fact elected President of the Harvard Law Review in 1990. 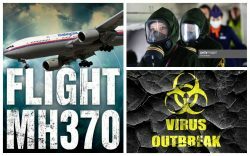 While these three articles may have been published as claimed, their veracity cannot be substantiated until original hard copies are obtained. Firstly, on February 5, 1990, the New York Times allegedly published a report entitled “First Black Elected to Head Harvard’s Law Review” (see above photo) whose second paragraph stated that “Mr. Obama was born in Hawaii”. The fact that the report highlighted Obama’s alleged place of birth is rather curious and suggests it was premeditatively written in order to sell the notion that Obama was born in Hawaii, not Kenya or Switzerland. It’s almost as if the New York Times was anticipating the “Birther” issue nearly 2-decades prior to its fruition in reality. This fact alone suggests that the article may have been written at a later date, hence the need to obtain a hard copy of the actual reports. Also, Obama is wearing the same jacket and turtleneck as he is in 5 other photos (see below) which were evidently taken as part of a CIA-ordered photoshoot. Consequently, it appears that the New York Times created the article at the behest of the CIA which suggests that its likely fraudulent in nature. 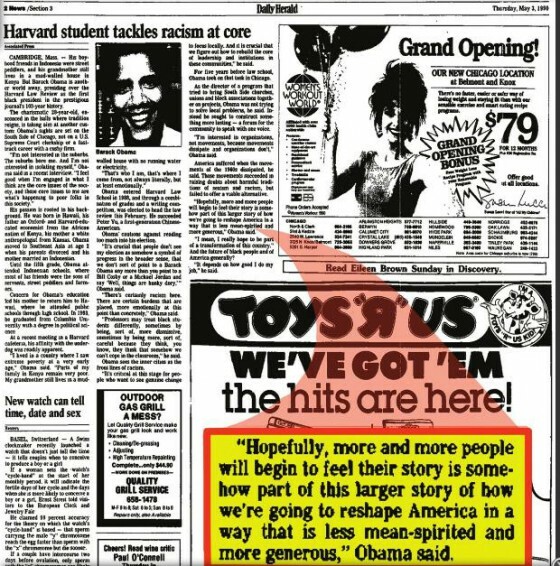 Secondly, Jet magazine allegedly published a report on February 26, 1990, entitled “Harvard Law Review Gets First Black President” (see above photo) which also documented Obama alleged election as President of the Harvard Law review. Thirdly, in June of 1990, Vanity Fair magazine allegedly published a report entitled “Harvard Law Reviews: Kicking Down Doors” which also highlighted Obama new position as President of the Harvard Law Review. Although the URL of the Vanity Fair reports includes the date “1990/06” (i.e., June of 1990), the actual publication date on the report is July 22, 2008. The 18-year time delay suggests that the report is fraudulent in nature and was likely fabricated at a later date. Again, until original hard copies of the aforementioned reports are obtained, their veracity cannot be substantiated for they have only retrieved online. Consequently, it’s highly likely that the New York Times, Jet and Vanity Fair reports were fabricated in whole after the fact. In other words, they never published in 1990 as claimed but rather at a later date like the Vanity Fair report. Lastly, in order to further sell the notion that Obama was elected President of the Harvard Law Review in 1990, the Huffington Post published a report on February 6, 2015 entitled “Obama Was Breaking Barriers 25 Years Ago Today”. Needless to say, report’s claims appear to be fraudulent in nature. Because Barack Hussein Obama II was evidently born and raised in Switzerland, it’s highly likely that Obama never attended Harvard Law School. Consequently, the video entitled “Young Barack Obama: Protest Speech at Harvard Law School in 1991” (one of only two video from Obama’s three years at Harvard) is likely a forgery and a fraud. In the video, Obama is seen introducing law professor Derrick Bell during a protest at the Harvard campus in Cambridge, Massachusetts. Whether Obama was at Harvard that day is not known, there are some striking anomalies in respect to the video that must be addressed. Firstly, Obama’s likeness in the video is quite fuzzy while other parts of the video is very clear, namely the face of professor Bell. Secondly, there is no up-close video footage of Obama while he is introducing Bell which suggests that the video was edited and spliced. This would be done in order to cover-up the fact that Obama’s words did not match the movement of his lips, hence the timely cuts. Thirdly, as previously mentioned, the video contains numerous unnatural cuts just prior to, during and shortly after Obama’s speech which also suggests that the video was tampered with in part or in whole. In all likelihood, CGI (computer-generated imagery) was used to insert Obama’s likeness into the video while a voiceover was done. This notion is corroborated by the fact despite being such close a friend and mentor to Obama as documented by the video, there is not one single photo of Obama and Bell together, despite the fact that Bell allegedly visited the White House on two separate occasions in 2010. Since Bell died in 2011, his alleged relationship with Obama will forever remain a mystery. Lastly, since Bell was known to be highly “racist” against white people, it can be deduced that the video in question was likely fabricated by a CIA-run Hollywood studio in order to: a) foment a race war in America, b) sell the notion that Obama attended Harvard, and c) sell the notion that Obama was politically active on campus. Because Barack Hussein Obama II was evidently born and raised in Switzerland, virtually all of his photos from his alleged time at Harvard Law School in Cambridge, Massachusetts were either staged as part of a CIA-ordered photoshoot or photoshopped. As evidenced, Obama took part in at least four professional photoshoots which were conducted on the campus of Harvard campus and in city of Cambridge over the period of approximately 3-years. Consequently, to date, no photos of Obama with his alleged classmates or members of Harvard’s faculty or staff have been discovered. In other words, despite being a politically active celebrity on campus, there is no photographic proof other than the four photoshoots that Obama actually attended Harvard as alleged. ROW 1: The first three black and white photos were likely taken in the Harvard library between 1988 and 1989 as part of a CIA-ordered photoshoot as evidenced by the fact that Obama is wearing the same clothes in all three photos. The photos in question were designed to: a) sell the notion that Obama attended Harvard as alleged, and b) sell the notion that Obama was a good student and therefore was deserving of his position as President of the Harvard Law Review. The second three color photos were obviously taken at various locations on the campus of Harvard, most likely between 1988 and 1989. They were evidently taken as part of a CIA-ordered photoshoot as evidenced by the fact that Obama is wearing the same clothes in all three pictures. Needless to say, the photos were designed to sell the notion that Obama attended Harvard as alleged. ROW 2: The five photos in row two were evidently taken on the campus of Harvard and in Cambridge as part of another CIA-ordered photoshoot, most likely between 1989 and 1990. 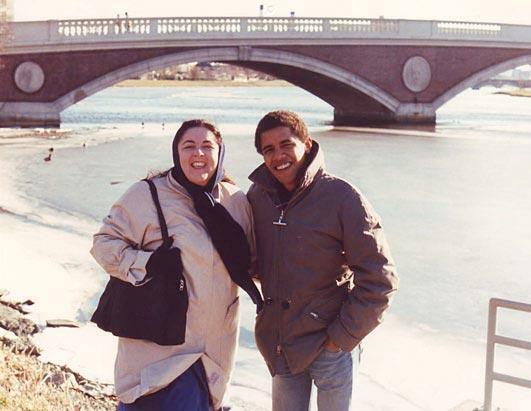 In the middle photo, Obama is pictured in front of a bridge in Cambridge with his alleged mother Ann Dunham. Aside from being the only photo taken of Obama and his mother within the continental United States, Obama is curiously wearing the same jacket, jeans and sweater as the other photos in question. Consequently, it’s highly likely that Obama and his alleged mother were flown into Massachusetts from Switzerland specifically to partake in a professional photoshoot which was designed to help sell the notion that Obama has an actual family and attended Harvard as alleged. Also, Obama is wearing the same jacket and turtleneck in the New York Times report from 1990 (see above photo) in respect to his election as President of the Harvard Law Review. ROW 3: The first three black and white photos were likely taken in the Harvard library sometime between 1990 and 1991. 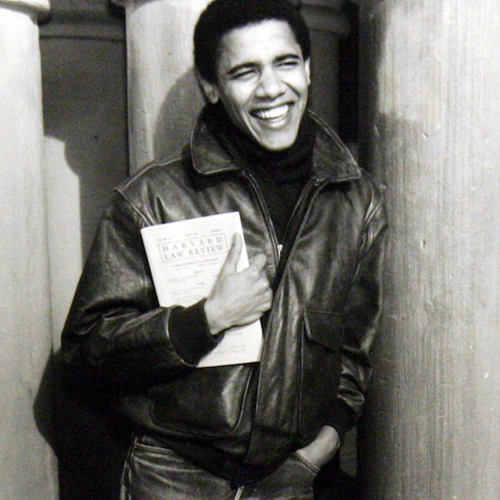 Considering that Obama is sporting the same complexion, haircut and black turtleneck in all three photos, it appears that the photo of Obama with the Harvard Law Review book in his hand was taken during the same CIA-ordered photoshoot. Needless to say, the photos in question were designed to: a) sell the notion that Obama attended Harvard as alleged, b) sell the notion that Obama was a good student and was therefore deserving of his position as President of the Harvard Law Review, and c) sell the notion that Obama was in fact President of the Harvard Law Review. 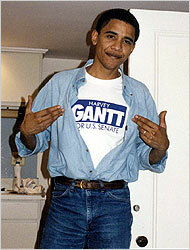 The bottom right photo of Obama wearing a “Gantt for U.S. Senate” t-shirt was allegedly taken by fellow student Bradford Berenson on election night, November 6, 1990. The photo, which Obama signed and allegedly sent to Democrat Harvey Gantt, is yet another public time stamp designed to sell the notion that Obama was living in Cambridge, Massachusetts in 1990. Lastly, it is imperative to note that the person or persons responsible for taking the aforementioned photos of Obama has never been publically identified. Also, there are no photos of Obama graduating from Harvard Law School in 1991. Since virtually all college graduations are photographed in excess, the lack of photographic evidence from such a historic occasion in Obama’s life is quite telling and speaks for itself. Because Barack Hussein Obama II was evidently born and raised in Switzerland, it’s highly likely that he never attended Occidental College, Columbia College at Columbia University and Harvard Law School as alleged. Consequently, Obama would not have obtained the necessary degrees which would have enabled him to teach at the University of Chicago Law School as a lecturer from 1992 until 1996, and as a senior lecturer from 1996 until 2004. Obama would also not have gained the necessary education and real-world experience needed to teach at the university level in a competent manner, especially on the subject of constitutional law. The notion that Obama never taught law at the University of Chicago Law School is corroborated by a wealth of direct, circumstantial, photographic and videographic evidence (or lack thereof) which suggests that Obama’s time at the University of Chicago Law School has been completely fabricated. Although Obama may have been secretly employed by the school, it appears that he never taught a single class with actual students. According to an official statement from the University of Chicago Law School (see above photo), the law school has “received many media requests about Barack Obama, especially about his status as “Senior Lecturer”. Evidently, the school’s Alma mater and faculty did not recall seeing a tall African-American lawyer from Harvard during the years that Obama was allegedly employed by the university. During the 2008 U.S. presidential campaign, Obama regularly referred to himself as “a constitutional law professor” which was in essence validated by the University of Chicago Law School who confirmed that Obama “served as a professor” and was “regarded as” a professor. However, they have since changed their position due to growing pressure from students and staff who don’t remember Obama. In order dispel the incessant rumors that Obama never taught at the University of Chicago Law School, a semantical publicity stunt of sorts was executed by the Chicago Sun-Times (at the behest of the CIA) on March 28, 2008, when they published a report entitled “Obama Did Not “Hold the Title” of a University of Chicago Law School Professor”. The shocking report stated that although Obama taught courses part-time at the school, he never held a professor title at the University of Chicago School of Law. “He did not hold the title of professor of law”, stated Marsha Ferziger Nagorsky, an Assistant Dean for Communications and Lecturer in Law. Nagorsky attempted to cover for Obama by stating that the status of a senior lecturer is similar to the status of a professor and that Obama did teach core courses usually handled by professors. Nevertheless, considering Obama allegedly served as President of the Harvard Law Review, the notion that he was relegated to teaching “three courses per year” of relative unimportance would be belittling to say the least. The report also revealed that Obama did not have any scholarly research obligations, meaning that he had no academic duties as professors generally do. Also, Obama was not part of the academic search process, meaning that Obama was never vetted by the faculty and staff of the University of Chicago prior to being hired. In summation, Obama taught one course per semester (roughly 36 courses over a period of 12-years), was not vetted by his academic peers prior to being hired (which is standard operating procedure in academia), had no scholarly research obligations (i.e., had zero academic accountability), was promoted from lecturer to senior lecturer after just 4-years (approximately 12 courses), and was able to retain the fraudulent title of “professor” for 16-years before being exposed and subsequently demoted to “lecturer”. Needless to say, Obama’s alleged professorship at the University of Chicago Law School is unprecedented in academia and therefore likely never transpired in reality. According to a New York Times report from July 30, 2008, entitled “Teaching Law, Testing Ideas, Obama Stood Slightly Apart”, Obama was nowhere to be found on the campus of the University of Chicago Law School. Obama, who reportedly declined to be interviewed for the article, was “well liked at the law school, yet [Obama] was always slightly apart from it, leaving some colleagues feeling a little cheated that he did not fully engage”. In other words, Obama did not engage with students and staff because in all likelihood he wasn’t on campus to do so. This notion was essentially confirmed by the report which stated that, “Three times a week, professors do combat over lunch at a special round table in the university’s faculty club, and they share and defend their research in workshop discussions. Mr. Obama rarely attended, even when he was in town”. According to Dennis Hutchinson, “I’m not sure [Obama] was close to anyone”, except for constitutional law professors such as Cass Sunstein who coincidentally was an adviser to Obama’s 2008 presidential campaign. In other words, Obama was not engaged with the students and staff of the University of Chicago Law School, did not participate in professorly functions, and was not friends with anyone on campus. There is also the issue of Obama’s legal knowledge (or lack thereof) in respect to the U.S. Constitution, a subject which he allegedly taught at the University of Chicago Law School. During his State of the Union address on January 27, 2010, Obama stated that, “We find unity in our incredible diversity, drawing on the promise enshrined in our Constitution: the notion that we’re all created equal”. However, the exact phrase “created equal” is not found in the U.S. Constitution but rather in the Declaration of Independence. As a Harvard trained constitutional lawyer who served as President of the Harvard Law Review, the mistake is unacceptable and suggests that Obama knows not of what he speaks. Although there are no videos of Obama during his 12-year tenure at the University of Chicago Law School, he was prominently featured in a commercial for the school as depicted in the video entitled “University of Chicago Law School — Ideas & Action” which was uploaded onto YouTube on January 21, 2011. Lastly, in order to help sell the notion that Obama was employed by the University of Chicago Law School as alleged, it was reported on May 1, 2015, that Obama picked the University of Chicago as the sight for his presidential library, an ironic gesture to say the least. Because Barack Hussein Obama II was evidently born and raised in Switzerland, virtually all of his photos from his alleged professorship at the University of Chicago Law School were either staged as part of an elaborate photoshoot or photoshopped. As evidenced, Obama took part in a number of professional photoshoots on location at the University of Chicago Law School which were designed to sell the notion that he was actually employed by the school. Aside from the fact that only 7 photos of Obama have been discovered from his alleged 12-years at the school, there are no photos of Obama with any faculty, family or staff members, and only 2 photos with alleged students. 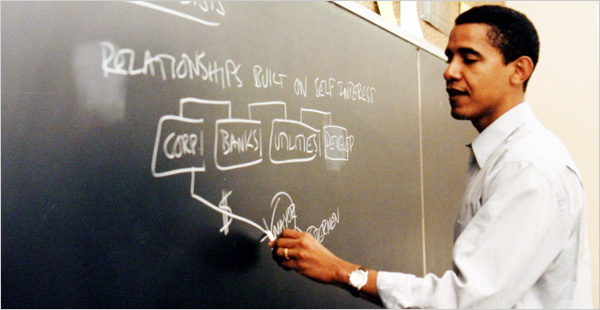 PHOTO 1: In the top left photo, Obama is pictured writing on a blackboard which was allegedly located in a classroom at the University of Chicago Law School. Considering that there are no students in the picture and the date and location of the photo is unknown, it’s highly likely that the photo was part of a CIA-ordered photoshoot designed to sell the notion that Obama was a professor at the University of Chicago Law School. PHOTO 2: In the middle left photo, Obama is pictured giving a lecture to students which are allegedly enrolled at the University of Chicago Law School. The photo is a still from a commercial which prominently features Obama as depicted in the video entitled “University of Chicago Law School — Ideas & Action” which was uploaded onto YouTube on January 21, 2011. Considering that the original video of Obama lecturing has never been released, it can be deduced that it was likely staged in order to sell the notion that Obama was a professor at the University of Chicago Law School. PHOTO 3: In the bottom left photo, Obama is pictured leaning over a table while supposedly teaching a group of students at the University of Chicago Law School. Considering that the photo is rather blurry in nature, it suggests that the photo was photoshopped. Also, considering that the date and location of the photo is unknown, it’s highly likely that it was photoshopped in order to sell the notion that Obama was a professor at the University of Chicago Law School. PHOTO 4 In the top middle photo, Obama is pictured talking with three of his alleged students at the University of Chicago Law School. Considering that the letters “FLAUM” and “HALL” can be seen in the top left part of the photograph (i.e., “Pflaum Lecture Hall” is a building on the University of Chicago Law School campus), it can be deduced that the photo was premeditatively taken on location at the school as part of a CIA-ordered photoshoot designed to sell the notion that Obama was actually a professor at the school. Also, the date of the photo and the identity of the three alleged students has never been established which is highly suspect. PHOTO 5: In the bottom middle photo, Obama is once again pictured with three of his alleged students at the University of Chicago Law School. Similar to photo 4, the photo in question was evidently taken at the University of Chicago Law School as part of a CIA-ordered photoshoot to sell the notion that Obama was a professor at the school. Again, the date of the photo and the identity of the three alleged students has never been established which is highly suspect. 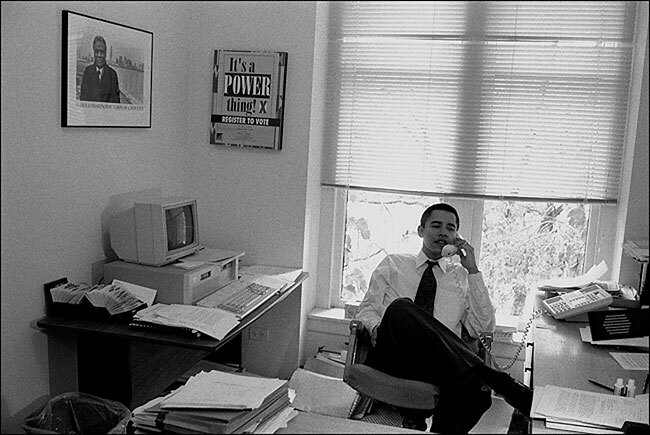 PHOTO 6: In the top right photo, Obama is pictured in his alleged office at the University of Chicago Law School in 1995. Interestingly, the photo contains a portrait of the late Chicago Mayor Harold Washington, and “It’s a Power Thing” poster from 1992, a political campaign which Obama reportedly worked on. The aforementioned objects were evidently placed in the room to personalize and time stamp the photo in a desperate attempt to sell the notion that Obama was a professor at the University of Chicago Law School. PHOTO 7: Lastly, in the bottom right photo, Obama is pictured speaking to an alleged group of students at the University of Chicago Law School. Considering that the date and location of the photo is unknown, it’s highly likely that the photo was staged in order to sell the notion that Obama was a professor at the University of Chicago Law School. Because Barack Hussein Obama II was evidently born and raised in Switzerland, it’s highly likely that he never attended or graduated from Harvard Law School as alleged, making it impossible for him to obtain the necessary law degree which would have enabled him work as a bar certified lawyer in the state of Illinois. According to FactCheck.org, a project of the Annenberg Public Policy Center, Obama has not released the list of his 30-plus clients that he allegedly represented while he was a lawyer with the Illinois firm entitled “Davis, Miner, Barnhill and Gallard”. That being said, in 2008 the Obama campaign confirmed that Obama personally represented the liberal group ACORN in a 1995 lawsuit against the state of Illinois which was designed to make voter registration easier. However, until a hard copy of the lawsuit is obtained, its veracity cannot be substantiated. Needless to say, the lack of transparency in respect to the Obama alleged clients is highly suspect and suggests that he never practiced law as an attorney in the state of Illinois as alleged. If Obama’s name was actually on dozens of lawsuits as alleged, the nature of said lawsuits would surely have been disclosed. After all, Obama is the biggest celebrity in the world and therefore a legal document with his name on it would be worth a small fortune. The notion that Barack Hussein Obama II never graduated from Harvard Law School or taught constitutional law at the University of Chicago Law School is corroborated by the fact that he does not have—and likely never did have—a valid license to practice law in the state of Illinois. According to FactCheck.org, a project of the Annenberg Public Policy Center, Obama graduated from Harvard Law School in 1991 and was admitted as a lawyer by the Supreme Court of Illinois on December 17, 1991. Prior to being elected to the Illinois State Senate in 1996, Obama allegedly worked as a civil rights lawyer at the firm formerly known as “Davis, Miner, Barnhill & Galland”. However, only four days after Obama announced that he would run for President of the United States in February of 2007, he voluntarily elected to have his law license placed on “inactive” status. Then, just days after becoming president on January 20, 2009, Obama once again voluntarily elected to have his law license placed on “retired” status in February of 2009. Had Obama actually earned his law degree as alleged, he would not be in such a rush to rescind it. By placing Obama’s alleged law license on “inactive” and then “retired” status, the CIA was hoping to dispel the notion that Obama’s law degree and his subsequent professorship at the University of Chicago Law School were fraudulent in nature. In order to make Obama’s inexplicable surrendering of his law license less of an anomaly, his wife Michelle Obama, who actually graduated from Harvard Law School in 1988, voluntarily placed her license on “inactive” status. The excuses given by the Obamas for the inexplicable retirement of their collective law degrees was that: a) they would have been required to pay an annual fee of $289 (now $342), and b) the would have had to take classes to satisfy the state’s Minimum Continuing Legal Education (CLE) requirement in order to keep their licenses active. Needless to say, lawyers on retirement status don’t have to pay an annual fee or take classes. Considering that the Obamas are worth millions and CLE classes are available online, the retirement of their respective law degrees is highly suspect to say the least. In short, the Obamas are lawyers in theory but don’t have the necessary license to practice law. Conversely, President Bill Clinton retained his law license until he was convicted in a court of law of making false statements during the Monica Lewinsky trial. Clinton’s perjury resulted in the “Voluntarily Surrender” of his law license. Consequently, if Obama was the former President of Harvard Law Review as alleged, it would stand to reason that: a) he would do everything in his power to retain his law license after years of hard work, and b) in the event that he no longer wanted to practice law, he would let his license expire rather than expediting its retirement. Needless to say, the haste at which both Barack and Michelle Obama distanced themselves from their respective Harvard law degrees is highly suspicious considering that said degrees are highly coveted and extremely hard to come by, especially for African-Americans.